Piff: What’s this giant heap? Mmmmmm?! Fan mail? But I’m not good at responding. I really don’t wanna. There’s so many. Can’t I just– Fine! But just a few! Fan mail: Piff, will you marry me? Piff: Umm... Here. *dances while makes faces* You merried now? Fan mail: Hello. Hello? I tried sending this message via my own trained pigeon. Did it arrive? How many days did it take? Is the pigeon in good shape? Can you make out my handwriting? Piff: Hi! Yes! What? I don’t– Kinda. Maybe? I’m not entirely sure. Fan mail: Hi, Peouf. About next week’s meeting, I don’t think you need to come. We’ll be fine. Trust me. Piff: Hi. I don’t know what you’re– Oh, this isn’t for me. Hold on, I’ll find Peouf and tell them! Piff: No, that’s enough pigeons! I’m going! I must find Peouf! Narration: You too can send mail to Piff! That has to be the third most shifty-eyed Piff I’ve ever seen. Once again, thank you for the mail! We saw some interesting ones in the pile, but unfortunately this Piff left before he could read them... We will have to wait for the next Piff to take on the task. This Piff is an owly form of Mathieu Moyen, maker of the webcomic 6-commando. 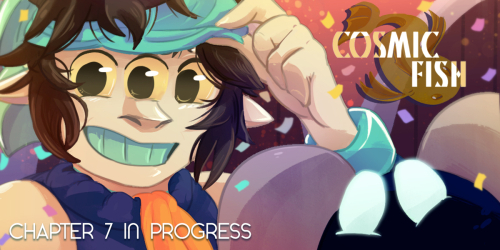 He backed the previous SpiderForest Anthology and got himself a cameo. May his squinty face stay plastered in history for eternity! Next, let’s visit some other worlds with the following comics of the week. 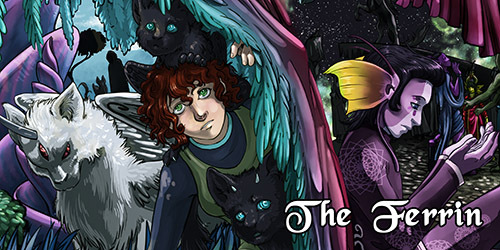 The Ferrin – Elanor Standish just wanted to finish her paper on the wild Alien species, the Ferrin, not uncover secrets hidden from and by the galactic superpowers that control the current universe. YA to mature. 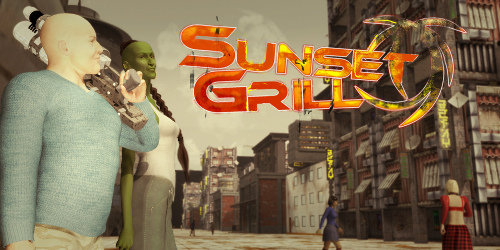 Sunset Grill – Gangsters. Soldiers. Public defenders. Ordinary people struggling to survive in an extraordinary future. They all have one thing in common: they all drink beer. Cosmic Fish – Soon-to-be resident-snake/fish monster Acantha has rejected the childish idea of solving the mystery as to why her unusual kind exists and why they’re deemed the enemy of the planet. That may very well change when the child-like guardian (and known monster hunter) Bells believes they can work together to find peace. But both have a long way to go as they each have to face their mistakes and learn from the past to find a hopeful future.